thumbnail images are clickable links. 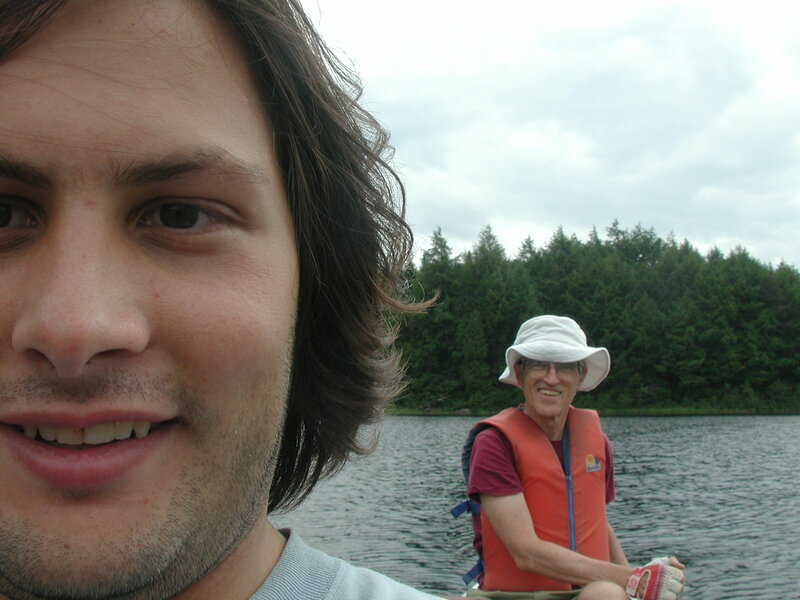 This is a story about a pleasant 3 day canoe trip. For several years now, in the summer, I've attended the Ottawa Linux Symposium (OLS). I enjoy the town, the conference and Canada. I spend most of my time at the conference hanging out with Roberto Nibali (Ratz) and other members of the Linux Virtual Server (LVS) Project testing the Canadian beer and discussing esoteric points of programming. Here are my LVS pages including links to OLS. One of my other interests in life is hiking and spending time outdoors. I put some effort into finding places to go and arranging time to go there. Perhaps because my trips to Ottawa are work sponsored, and I'm only allowed 5days away, it never occured to me to take vacation and do a trip in Canada while I was at OLS. The 18,000km Trans Canada Trail goes through Ottawa and when I needed a break from sitting in the conference, I had walked along parts of it. I looked admiringly at the route on the displays set out along the path, but even as you slowed down to read them, the Ottawa mosquitoes descended, sucking your life blood and I realised that the Trans Canada Trail was only for tougher men than I. I hadn't thought again about the Canadian outdoors in summer. 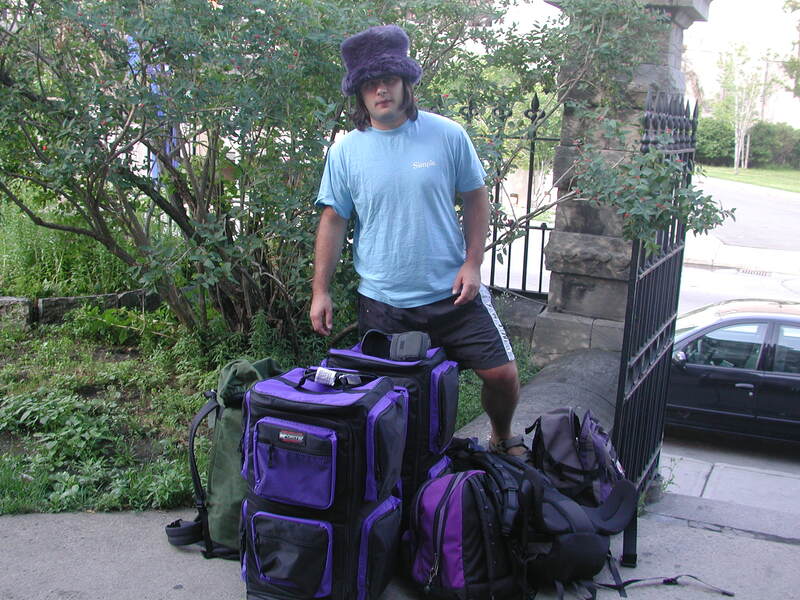 For OLS 2003, Ratz phoned from Switzerland to see if, while in Ottawa, we could do a trip. I slapped my forehead, for not having thought of it myself, and said I'd see what I could do. We'd want a trip where we could step straight off a plane and not get into too much trouble through ignorance. Previously I had considered go in the spring to Manitoba for a birding trip, but it was too expensive and I had already shelved plans for it. Hiking was out, as I didn't know anyone to recommend places. I would either wind up on a trivial trip or one beyond our capabilities without knowing what we were in for, till we were committed. Another problem was that anywhere within driving distance of Ottawa seemed fairly flat. Canoeing came up soon enough after a few web searches. The canoes used were what were called "canadians" where I grew up. Where to go? There were many possibilities and many webpages described trips. One described near-death by mosquitoes, and another a week of rain in a canoe. This was just the thing. Soon enough my search converged on Algonquin Park. I already had some affinity for the place from doing moonbounce with the ham radio station VE3ONT located near the park. 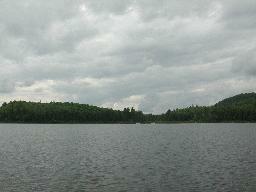 Algonquin Park was large (visible on maps) and well known. Although it probably wouldn't be a peak wilderness experience, I'd be on well travelled routes and for a person who didn't know anything about the area, I could expect a good time. There were several interlocking problems I had to work out at this stage. I had to get a car, find a trip route in the park, which fitted our schedule, rent canoes, and get the camping permits. I started phoning in March for a trip in July. I was initially connected with a canoe rental place at the opposite end of the Park to where I'd be entering. When they'd dug themselves out of the snow, they figured out what had happened and kindly referred me to their competition at the end of the park, where I'd be arriving. Otherwise I would have spent the rest of my daylight time on the arrival day driving the length of the park. Information about the park was difficult to find. The Ontario Govt (the Park, in getting initial information and later the agency which booked my trip into the Park) were obtuse. To find anything about the park, like where to canoe, you didn't talk to the park ranger (as you do in USA). Surprisingly you call the Friends of Algonquin Park (http://www.algonquin.on.ca/friends.html). The Friends didn't answer the phone much and when I got onto them, seemed to be bothered that I'd called them at all (at least for the first few phone calls). When I did get onto them, they gave me all the right information, so I'm not complaining a whole lot. I explained that it was my first trip to the Park, that I didn't particularly care where I went and I just wanted to paddle around, camping out 2 nights and see some wildlife and enjoy being outdoors. So that I'd understand their suggestions, they sent me a map of the Park with the campsites and canoe routes and length of portages. When it arrived, the map didn't mean a whole lot to me, and as suggested I called them back for a rundown of the park. I was given two suggestions for trips, both of which sounded fine to me. It appeared that these were the two standard trips for people who didn't know the place (these turned out well). To help give people the feeling of being alone in the wilderness, everyone has exclusive use of their campsite. This requires you to stick to your travel plans, so that two parties aren't at the same campsite on a particular night. I picked a trip where we could camp at the same site on both nights, leaving our gear at the camp to paddle around for as far (or little) as we were inclined on the day in between. The campsite was about 3hrs paddling from the put-in place, allowing us to drive up from Ottawa starting in the morning and still be able to get to the campsite before dark (I hate setting up and cooking in the dark). Who the Friends of Algonquin Park are, I never found out. Their website doesn't tell you if they're volunteers or some non-governmental agency. I don't know how they're supported ($) - certainly the money they made on the map I bought didn't pay for the time the Friends spent with me explaining the different trips I could take. I then went to book my camping permits for the trip with the Ontario Govt. The webpage to book the campsite was unnavigable and somehow I found a phone number to call instead. There, before I was allowed to pay my money, I endured a pitch on the wonderful website that they had gone to so much trouble to setup for my convenience and which I should have used instead. Renting a car was difficult. Trying to book through the car company in USA just didn't work. One US company insisted on renting me a car in Ontario, CA, rather than Ottawa, Ontario, Ca. Renting from a Canadian company had other problems. The Canadian agent wanted to know where I was going with their car. I told them the destination (Algonquin Park) but they didn't know far it was from Ottawa and expected me to tell them. I needed evidence of insurance from my US insurance company (which I got OK). Some prices were absurdly high. For my initial attempts, it was not possible to pick up a car from downtown Ottawa on a Sunday morning. I would have to pick up from the Airport (the only place open on Sunday) and drop the car back to the airport on my return. This would add an hour to our trip in both directions. The outward direction already had a marginal time budget. Then Budget, on one phone call, suddenly declared that their office downtown was open on Sunday (although the week earlier, they weren't) and the price was reasonable. I booked the car before they changed their mind. Their office was about 30mins walking from the Ottawa Jail (the Youth Hostel, my home away from home, when I'm in Ottawa). They would pick us up from the Hostel saving us the extra time. It certainly wasn't the service oriented trip booking I expect from living south of the border. Both of us would be arriving on Saturday evening, Ratz from Switzerland after 24hrs on various forms of transport, while I would be arriving by a much easier trip of a few hours, from North Carolina. Not knowing where to buy food or having any time to, I brought camping type food for both of us. Since I couldn't bring fuel for the stove on a plane, I planned to buy camping fuel on arrival. I expected the weather to be on the cool but pleasant side, and I looked at the weather maps of Ontario in the weeks before I left for confirmation. It's difficult, when you're living in strong sun and temps in the high 30's, to pack for a trip with temps in the 15-20° range - you just can't imagine being cold. About 2 weeks before the trip, I called the canoe rental place Opeongo Outfitters to ask them about the weather and temperatures. The guy who answered wouldn't tell me (said he didn't know). Since he was (as I found out on arrival) in an uninsulated wooden building, filled with canoes and outdoor paraphenalia, with open doors, I found this hard to believe. On pressing him for a temperature, he told me "30°". I couldn't believe this either, as it rarely get out of the low 20's in Ottawa in summer. Ratz and I found each other at the Youth Hostel on saturday night and were picked up the next morning by the Budget Car Rental person and we headed off west, still with not much idea of what time we'd arrive at the Lake (or at our campsite). Figure 1. Ratz outside Youth Hostel in Ottawa waiting for rental car. For quite a way out of Ottawa, the geology was the same horizontal limestone strata (obvious in roadside cuts) seen everywhere in Ottawa. I was expecting the fabled Canadian shield, the oldest rocks on the surface of the earth. With unending vistas of limestone, I wondered if I'd made some mistake. About half way out I was relieved to see the end of the limestone, and the start of scenery like the photos I'd seen of Algonguin. The weather was not particularly clement on the way out, and although mid-summer, we had grey skies, cool temps (low 20s) and intermittant bursts of rain. We stopped at a SubWay sandwich place for lunch and sat next to the window where we looked incredulously out onto a gas station opposite, displaying a sign exhorting passers by, to come in for their annual summer car air conditioner checkup (presumably before the snow returned and you decided you didn't really need your A/C checked). I can't imagine anyone in Canada having a car air conditioner. Where do the technicians learn to service them? Having just stepped off a plane the night before, we still had supplies to consider. We pulled up at a long warehouse, standing behind bright signs advertising beer. Where I come from, you walk amongst the cases of beer and pick out the one you want. The room we entered was like a receiving dock at the end of the building, with no products in sight. Thinking I'd walked into the wrong building, I walked out again, checking the signs. Other people were milling about as if nothing was wrong and cases of beer were ocassionally emerging on a roller track, from a rectangular aperture in the wall, where they were picked up by the man behind the counter. OK they were selling beer, but was this wholesale or retail? This was a new one on me. I used to live in Vancouver BC - I thought I knew something about the place. As my mum says, travel broadens you. I realised that you looked at the pictures high on the wall to decide what you wanted (could the locals not read?). Trying to look cool (I didn't want them to think I was a gringo) I ordered a case of Sleeman's Honey Brown (my favourite). Although there was a whole warehouse of beer behind the wall, they didn't have a drop of it. Instead I took a case of a wheat beer (which turned out to be acceptable). Ratz hadn't brought a jacket, so we stopped at a mall to pick up some clothes. The free trade agreements that are in effect in N.A. and which have displaced the jobs of a whole textile industry in USA (and many other manufacturing industries before that), haven't taken place in Europe. The Europeans in their dotty old-world ways, have decided that it's more important for people to have jobs and that businesses only have to make enough money, not the obscene amounts they make here, and they've decided to keep their job creating industries right where they are now, in Europe. Ratz was amazed at the low prices of clothes. It's true, all our clothes are made in China now, at a fraction of the cost of 10yrs ago. Every cheap sneaker or pair of jeans represents jobs lost forever from NA. Of course it's not all bad news. Some of the people who lost their jobs have found news ones, selling sneakers at WalMart. We arrived in mid-afternoon at the canoe rental place, Opeongo Outfitters. The building was a nice new varnished two storey building - looked quite smart. 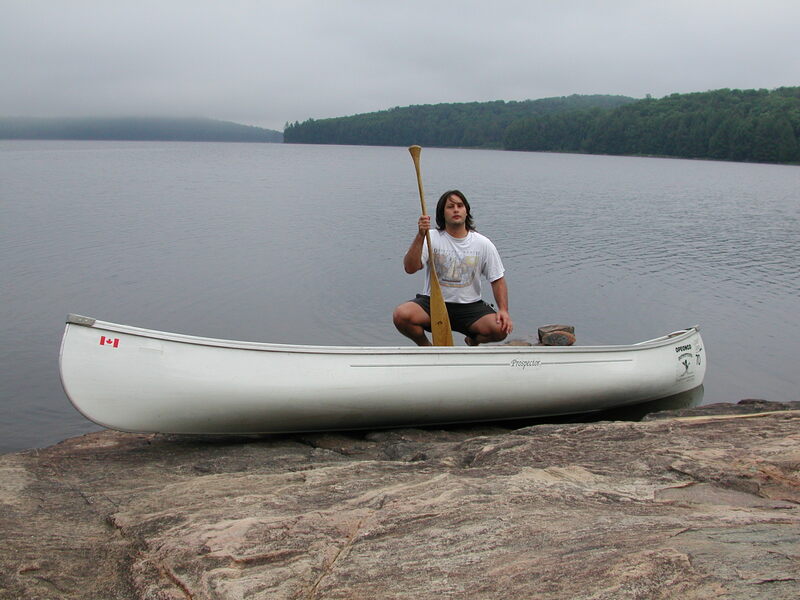 I presented my canoe rental information like I was checking in at an Airline counter. They eventually figured out who I was, but I could have just as easily appeared out of the blue and picked up the canoes. The middle of summer was not nearly as busy as I had expected. They had enough canoes on hand to outfit a few 747 loads of people. I would have thought they'd need hordes of people renting to cover the R.O.I. Having done most of my canoeing on white water, I asked for an extra paddle, which raised eyebrows, but I was adamant - I wasn't going to be stuck 2days out, with one paddle short. I also needed fuel for my stove. I had standard Coleman fittings, which had covered me well in USA, but there was no Coleman propane tanks here. The only equipment came from east Europe with incompatible fittings. I would have to buy the whole stove and there would be no hope of ever using it again. I spent sometime thinking about this and decided I could do without coffee, and cooked dehydrated dinners and we'd have a cold trip on the dried fruit and nuts I'd brought. If I do this again, I'll have some propane tanks ground shipped to the Youth Hostel in Ottawa. The outfitters had a canoe delivery service and not having a clue where we'd be, I'd originally asked them if they could drop off the canoes for us. As it turns out, the put-in spot was just up the road, at a standard boat ramp and the outfitters had all the usual rubber padding. They tied the canoe onto the car roof and we were off. I'd brought a pair of cyclists gloves for paddling, since my hands were soft from using a kbd. Ratz who rockclimbs regularly, eschews such things. His hands were tough. From living in from USA, I expected that alcohol wouldn't be allowed at all. USA still is hungover from prohibition, and you can be put in jail for giving your kids wine with dinner ("endangering the welfare of a minor"). Ratz, coming from a civilized part of the world, where kids grow up thinking that alcohol is a normal part of life, courteously asked what we should and shouldn't do. Since culturally Canada is closer to USA than Switzerland, I was operating on the "don't ask, don't tell" principle and would have kicked Ratz under the table, if we'd been sitting at one. R: "You can bring beer into the park, as long as it's in plastic bottles. You can't bring in beer in aluminium cans or glass bottles, as the Park doesn't want campsites littered. It's very simple really." J: "I'm supposed to pour my beer into a plastic bottle? It will be flat?!" J: "People who take plastic bottles don't litter, but people who take aluminium cans do?" Ratz is smarter than I, or maybe he just comes from a more civilised part of the world. I thought the ranger was saying that you'd couldn't take beer in aluminium cans into the Park. I just had to pour the beer into an empty plastic coke bottle and screw the lid tight. What would Bob and Doug MacKenzie think? Did they drink out of a plastic bottle? It seemed hard to imagine. Then, I'd have to drink a whole 2l. in one sitting. It's a long night in a tent with an extra 2l. aboard. I would have to start earlier in the day, rather than risking mayhem venturing into the unfamiliar night to commune with nature. I'm a card-carrying tree-hugging greeny, and there's been many a weekend trip where I've carried out a pack of flattened aluminium beer cans and recycled them. An aluminium can is the best way to enjoy your beer in the wilderness. Here's a perfect opportunity for the Sierra Club or Greenpeace to do some public education. I'd only ever canoed on rivers. There, you're trying to stop rocks from tearing out the bottom of your boat. You stand on rocks in the water and you're wet most of the time. You can expect the occasional roll, tipping your gear in the water. I'd brought sealed canoe bags and rented an extra paddle from the surprised outfitters in case I lost one rolling the canoe. The launch point was a boat ramp on a river, next to a camp ground. In a few minutes you're out on a lake. The lake was large enough that I didn't want to be in the middle of it, in case the wind came up and gave us some chop. I realised the water was deep and I wouldn't be doing a whole lot of standing in it, much less recovering anything that fell out and didn't float. The water was too cold to swim to shore from the middle. Rolling the boat was something you should avoid at all costs. I stuck to the shore and navigated from point to point on the shore line in straight lines. Unlike on a hike, you can't go to a high point to get a navigation fix, so I put some attention to keeping track of where I was, particularly since I wasn't used to navigating on a lake. As it turns out we only had the mildest breezes, and by day 3 I was starting to relax about being on a lake and didn't mind cutting from one side of a lake to the other, although I was still glad to get to the other side. The first lake (where you put in) was accessible by road. There were summer cabins along the shore. Since we were inside the park, I presume new construction is not allowed and these cabins were grandfathered in with the creation of the park. Once past the first portage, you don't see any more summer cabins and I started to imagine myself as Pierre, a french trapper plying the waterways of Canada 100-200yrs ago. Having seen photos from the air of the lakes and waterways in the NW territories, I knew it wasn't an easy life with moquitoes, much hauling and bitter cold in winter, but for 2 days I allowed myself to feel the romance of the era, without any of the pain. Every now and again, you'd pass another canoe load of people. It wasn't the superfit looking crowd of hikers carrying expensive spaceage lightweight gear that I was used to seeing in the outdoors. People were older, some overweight, some with kids aboard. This was a low stress outdoor activity. Figure 2. Party of 3 canoes on other shore of lake. The camp site was at one end of an island about 400m long. The site was a large cleared area, back from the water and could easily have accomodated a whole boy scout troop. It was more than luxurious, for 2 people in a two-man tent. The site was littered with 2l. plastic soda bottles ;-( We cleaned these up and took them with us on the way out, along with some aluminium beer cans that I didn't see when we arrived. The site was about nicely protected from wind (which we didn't get) by trees in all directions. Down at the water's edge, a large rock platform merged into the water and you could sit and look out across the lake eat your dinner and wax philosophical. It was very pleasant. We only saw the sun a few times, but the temperatures were about 20° during the day, and it only rained a whole lot once and that was at night, so it didn't disturb us too much. Figure 3. Ratz at rock platform at campsite. The other end of the island was occupied by two women and a troop of girl scouts and a large number of canoes. A whole bunch of young teenage girls had done the same trip as we had with no trouble at all. I wouldn't normally have disturbed them, but I was having trouble locating the toilet. As it turns out, it was a standard architecture long drop wooden thunderbox on the highest point in the island. How the Park people drilled a pit there into the Canadian shield I don't know. You sat in the open, on the throne, and from there surveyed your whole domain. They rest of the island could survey you too. I hope I didn't put the girl scouts off their food, as I didn't see the box getting any other use while I was there. Maybe Algonquin etiquette dictates that you only use the thunderbox under cover of darkness. but that has always seemed a rather dubious proposition to me: there's altogether too many things that can go wrong in the dark. I wouldn't want to crawl back into my sleeping bag in pitch darkness to realise only a few minutes later that there was a serious problem. 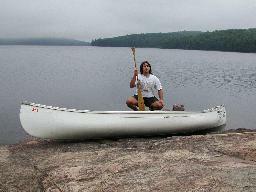 In Algonquin (and probably all Canada), "portage" rhymes with "fromage", and not with "porridge". Portaging was completely new to me. I expected to be hauling canoes over huge boulders for hours on end and tying ropes at each end of the canoe to stop it getting away from us in the raging torrent. Perhaps that's what happens on the MacKenzie R. after the spring thaw, but not here. It turns out that adjacent lakes differ in elevation by 10's of metres. The water flow is large and the rapids are uniformly sized rocks/boulders descending at constant slope. Any two lakes then are joined by what looks like a piece of road covered with rocks over which water is flowing. There's no clear channel in the middle (or anywhere), so it's impossible to get a canoe up or down the rapids. Presumably the hard canadian shield rocks determine the form of the rapids. Where I come from (Blue Mts, near Sydney), there is less water, the rock is soft cliff-forming sandstone, and the rapids, if you can find any, are filled with boulders that range in size from small to house size. In Algonquin, to portage, you carry your canoe and gear along a well formed track beside each set of rapids (usually several 100m away from the water). All portages are much the same (it would appear), the only variable being the length; some are only several 100m, while others are many km. The latter I would expect are epics in canoe- and gear-moving. Even the shorter portages require some strength and agility, to move the canoe up and down over tree roots and rocks. I had spent some time doing minimax sums, based on the problem of a farmer trying to take a fox, goat and bag of corn across a river, to optimize the number of transits needed for a portage. I didn't want to overload my 56yr old back. 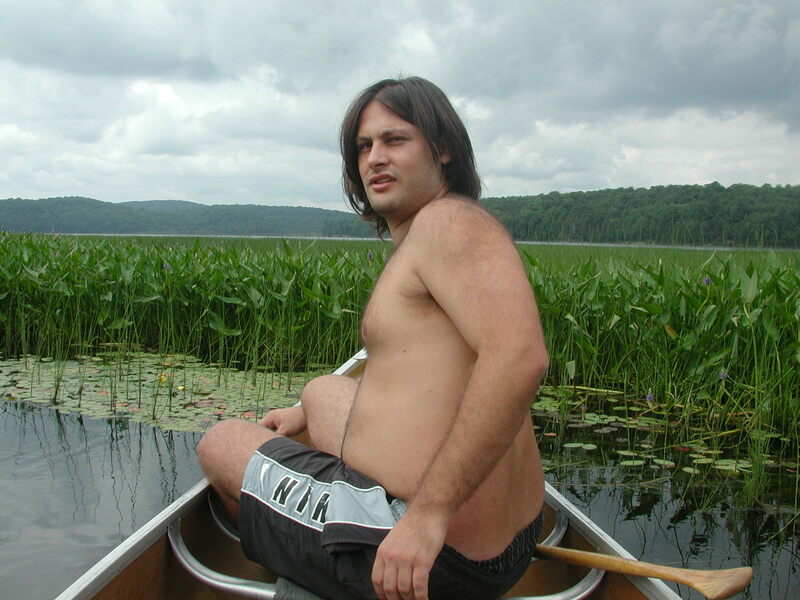 I couldn't see picking up one end of a canoe and man-handling it through a portage while carrying much on my back. I had figured that we could be doing many passes of the portage before having all our gear at the other end and this could take a large amount of our time. As it turns out, I hadn't reckoned with being with Ratz, who is as strong as the menhir delivering Obelix (http://www.asterix-obelix.nl/images/home/intro-obelix.gif). He put on his pack, lifted the canoe over his head and walked off up the portage, without any help from me. I just had to put on my pack. Usually we were done in 3 passes (out,back and out again). If you're going to portage, take someone like Ratz with you. Each canoe had a strut across the middle, with a U-shaped bend, that looked like a small toilet seat in the center line. I could only think that it was the emergency seat for a 3rd paddler (in case you came across an extra person looking for a ride). It wasn't till I saw several other parties portaging, or maybe I watched Ratz, that I realised that the cross strut (yoke) was to rest around your neck and on your shoulders to carry the canoe over your head - see How to Portage a Canoe (http://members.porchlight.ca/aferg/home_htpac.html). Figure 4. Leaving a portage. Ratz in front, Joe in back. Note sun hat. Can't be without them in the outdoors where I come from. Also note cyclists gloves for people with soft hands. I was prepared for a near death experience with mossies and brought a mossie net hat for both of us and bug spray (both DEET and pyrethrin types). I was prepared for the camp site to be so dense with mossies, that I'd have to paddle out to the middle of the lake to eat my food. On check-in at the Ranger Station, the Ranger dismissed my worries. I was at the end of mossie season and would have no problems. She was right, there was hardly a mossie, except for one place where we left our canoe and hiked up to a small lake just to see what was there. There you couldn't stop for the mossies. Otherwise we hardly used the spray. Ocassionally from the middle of the lake, we'd see moose on the side. The woods were quite thick and there could have been any number of moose further back, but we wouldn't have been able to see them. Once we were getting back into the canoe after a portage at a narrow end of the lake, when two moose burst out of the woods about 25m ahead of us, and swam with great haste across the lake in front of us and clambered into the woods on the other side, when they disappeared from sight. Loons were everywhere. They called all night "alla-alla-loo". I didn't realise that loons were active at night. It was quite noisy. We did see a couple of belted kingfishers and a few unidentified raptors. Despite having an interest in birds, we didn't see all that many, and I didn't record the ones I did see. I know it was bathtub grade water, but I still wasn't prepared to have the binos hanging around my neck while I paddled. The campsite had a noisy chipmunk. He chattered loudly at us as we moved about the campsite and clearly didn't welcome our intrusion. I later found out that chipmunks are territorial because they store nuts underground and don't want other critters raiding their winter stash, which apparently the bigger ones do quite often. Considering the area is under snow most of the year and is bitterly cold in winter, a chipmunk would need all the food he could get. I wouldn't want anyone tramping around my food store either. On the day we went canoeing and left the campsite setup, I strung our food in canoe bags between trees. 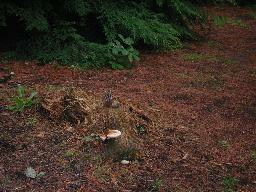 He was hoping all over them as we left and I expected to see them in shreds when I returned, but they were untouched. Figure 5. 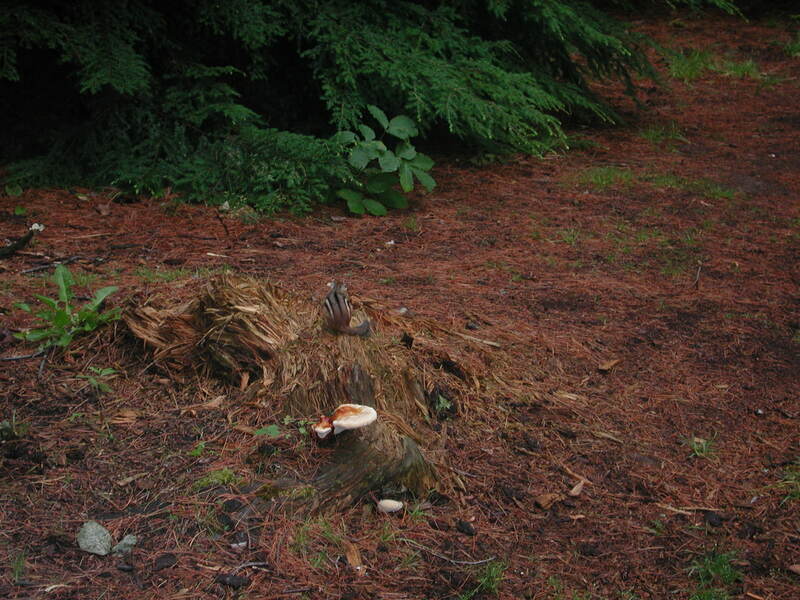 Our Chipmunk friend at campsite next to bracket fungus (obligatory artistic photo). There are several species of chipmunks, and someone told us what this was, but I can't remember now. 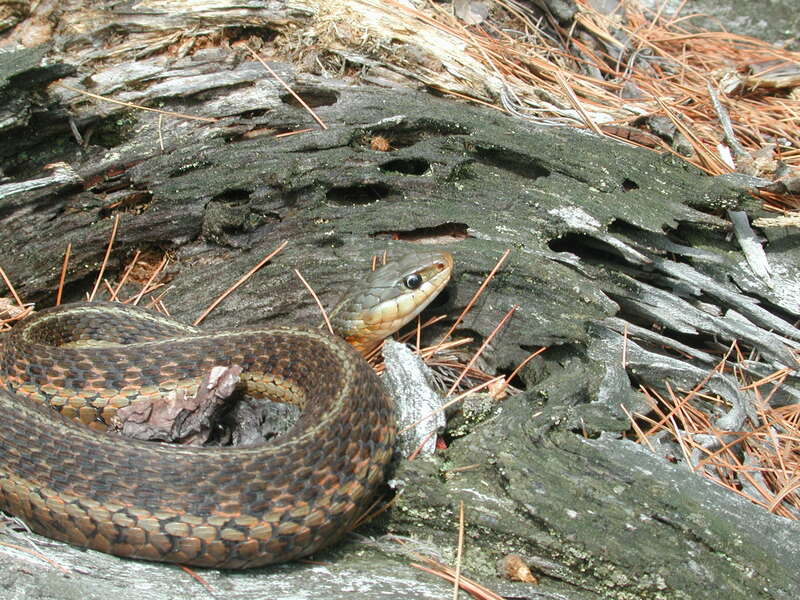 Exploring a beach, Ratz found about a dozen snakes curled up in the roots of a fallen tree. The roots were facing the sun and the snakes were soaking up some warmth. Ratz wanted to pick one up, but coming from a land where a snake bight can kill a horse in a few minutes, I was most alarmed at the prospect. Ratz told me that they were safe, but in deference to my concern, Ratz just took photos. On my return I find that cold climate snakes aren't venomous. I should know by now that Ratz knows what he's talking about. I'd heard about a "wolf howl" from friends who'd been to Algonquin. In the 1950's, someone at the Park realised that you could solve the problem of locating wolves by howling from the roadside. You didn't have to be particularly good at it; wolves would respond to just about any human imitation of a wolf howl. This allowed people for the first time to take a census of the wolves and to follow them around. Then someone decided to have a public wolf howl. With little announcement, people were told to drive to a spot on the road, turn off their lights, not make any noise and stand by their cars. The rangers would then start howling. The Park people expected at most a dozen people would arrive and wondered if any wolves would reply. They prepared for a complete bust. But about 1000 (at least from memory) attended (at least more people than anyone thought was in the Park at the time), everyone behaved (was quiet) and the wolves replied. Since then, the wolf howl has become a summer tradition in Algonquin. It's done about 3-4 times during the summer, so if you arrive at a random time and are only there for a few days, you'll miss out (as I did). Raising public awareness of the wolves has made it easier for politicians to protect the nearly exterminated wolves from hunting. For more info on Algonquin wolves see Algonquin Park - Nature (http://www.algonquinpark.on.ca/nature/mammals/wolf_howling.html) by "The Friends of Algonquin Park". On our 2nd day, we had nothing to do but paddle around and get back to the campsite in time to have dinner. We circumnavigated the lake. At the other end, a river came out of the hills and we decided to see how far up the river we could get. The river mouth was a delta filled with aquatic plants. The river snaked through the plants at a leisurely pace, but at least fast enough to keep a channel clear. Figure 7. 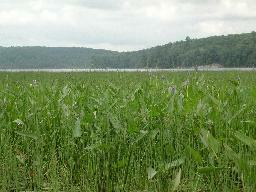 Aquatic plants at river mouth, looking back towards the lake. It didn't take too long before we came upon a beaver dam about 10cm high. Did the beavers build the whole delta we were on? We were still 100s of m. from solid ground and the channel was only as wide as the canoe. The only way we could get past the beaver dam was to haul the boat over it. I didn't think the beavers would like this, and since we had no hope of getting to solid ground here, we turned back. Figure 8. Ratz at our furthest point, confounded by beavers, within site of our goal. The beaver dam is upstream 100m or so from here. Do you think Ratz looks more like Fabio (http://www.fabioifc.com/), Jerard Depardieu (no photo available) or Obelix (http://www.asterix-obelix.nl/images/home/intro-obelix.gif)? 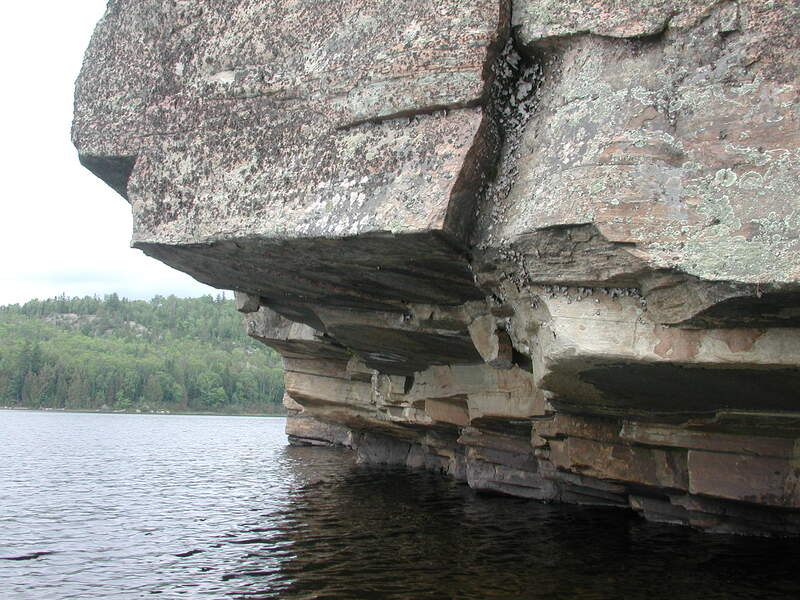 Here's a nice slab of Canadian shield rock. Ratz wanted to climb it. Figure 9. Canadian shield rock. At many places you visit (parks, museums), someone is hawking books etc. It seems like most of the money made at these places is not the entrace fees (which often are free), but on selling ding-dongs to the tourists. I usually walk away with a pile of books. Not here. Having just had a great time at Algonquin, I was looking for books on the Park. While I was waiting to checkout at the ranger on my return, I scoured the room for books on the geology, history, animals... anything. You couldn't spend a razoo on tourist fripperies here, even if you wanted to. The cupboard was bare. I wondered if it was deliberate: - maybe parliament had passed a law preventing the Park service from educating the general public. And why not? The US is doing it - to prevent terrorist attacks in the Florida Everglades, the govt has reduced the number of rangers offering guided canoe trips. It's working: rangers, already being paid less than high school teachers, are out on the streets and tourists are no longer seeing the natural wonders of the US. The money instead is being sent to the Dept of Homeland Security, who have taken over the role of showing the world what there is to love about the US. Back in Ottawa, I looked in the usual stores for books about Algonquin; nothing there either. On my return to North Carolina, I was blasted with the heat. For the next few days, I kept thinking I must be standing in the sun, and look around for shade, only to find that I already was in the shade. Because of the weather in NC, it's hard to imagine anyone voluntarily settling here. However, one of the early attempts at European colonisation of North America was Manteo Is., NC (named after a native chief who befriended the new arrivals). This colony is now remembered as the Lost Colony. The colonists brought with them coats of arms, suits of armour and silver chalices, to set up a working copy of English aristocracy in North America . They didn't bring any serfs and presumably expected to recruit them locally. I can imagine them with a grand piano, but it hadn't been invented yet. Having spent the summer tarrying in the Carribean, on a money making venture for the ship's captain, they arrived with little food, and too late in the year to plant crops for the coming winter. They didn't know how to fish with nets and didn't adopt the technique, when shown by the friendly natives. The leader of the colony realised the colony was in trouble and with the financially flush ship's captain, returned to England for more supplies. The colony appears to have got lost under unknown circumstances shortly after the killing of what, until then, had been friendly natives. The colony was trying to kill a completely different set of natives, who had taken their silver chalices. In retrospect, killing friendly (or unfriendly) natives, when you're the new kid on the block at the onset of winter, and you can't feed yourself, probably wasn't a real smart thing to do. Subsequent European settlers didn't learn anything from this, and continued to treat both friendly and unfriendly natives in the same way. The only knowlege we have of the Lost Colony comes from the colony leader on his return to England. As it happened, England had other things on its mind than a colony in the new world (e.g. the Spanish Armada) and it was 3 years before the relief ship returned (possibly with the grand piano). There was no trace of the colony, other than a rusted suit of armour and a carved sign saying something like "to Manteo", possibly indicating their new location. Whether the colony went native or died out or was killed, no one knows. By the time anyone thought to look for blue eyed people amongst the native american populace, too many other europeans had been in the area for too long, for anyone to know the origin of native americans with blue eyes. I remember being terribly offended 20yrs ago, on visiting the Flight Museum at Kittyhawk, a few km up the road from the Lost Colony. There I went to celebrate the achievments of the Wright brothers. The US has written much of the history of flight and can justly claim the glory deserved for its achievments. The Museum, as it turns out, is not a museum about flight, but is cold war propaganda about the achievements in flight of US citizens, US companies and the US military. The walls were covered in portraits of the people who were first some excessively restrictive category like "the first man to fly upside down in red underpants", continuing the "first white english child" theme endemic to the region. I noticed only one portrait of an non-US person. The US had chosen to be first in in offending people who know the history of flight. I don't remember any celebration of Santos Dumont, (http://www.centennialofflight.gov/essay/Dictionary/Santos-Dumont/DI41.htm) who didn't know about the secret flights of the Wright Bros and who in 1906 made the first publically witnessed heavier than air flight. I asked a friend, more travelled than I, about this. Why was public money spent just to offend tourists? He smiled "In Vienna they do the same thing. They'll tell you they're the centre of European civilization. All countries do this". I was not mollified.